How do the standards relate to the CHS? The Humanitarian inclusion standards for older people and people with disabilities provide guidance for what needs to be done in all sectors and at all stages to include older people and people with disabilities in humanitarian action. They reflect the approach of the Sphere Handbook, an internationally recognised set of principles and standards. Our Key Inclusion Standards are based on the Core Humanitarian Standard on Quality and Accountability (CHS), which many agencies already use as a tool to improve the assistance they provide. In a similar vein to Sphere and the CHS, the right to life with dignity is a central part of the Humanitarian inclusion standards for older people and people with disabilities. We put people at the centre, taking into account their capacities and needs, enabling them to participate to the fullest extent. The document reports that globally, around 15 percent of the population is living with some kind of disability. An estimated 13 percent of people worldwide is over the age of 60, and more than 46 percent of those who are over the age of 60 have a disability. Currently, most of these people are routinely excluded from humanitarian response. To help overcome the exclusion and to work towards sector-wide impartiality, the standards provide practitioners and organisations with clear actions that can be taken to protect, support and engage older people and people with disabilities. They give guidance to identify and overcome barriers to participation and access in diverse contexts, and at all stages of the humanitarian programme cycle. Using these standards will help organisations to successfully identify and reach those most at risk during a humanitarian crisis. The document consists of nine Key inclusion standards, derived from the Nine Commitments of the Core Humanitarian Standard on Quality and Accountability (CHS), and seven sets of sector-specific inclusion standards: protection; water, sanitation and hygiene; food security and livelihoods; nutrition; shelter, settlement and household items; health; and education. Each chapter presents a set of standards with key actions, guidance notes, tools and resources, and case studies illustrating how older people and people with disabilities have been included in humanitarian responses. 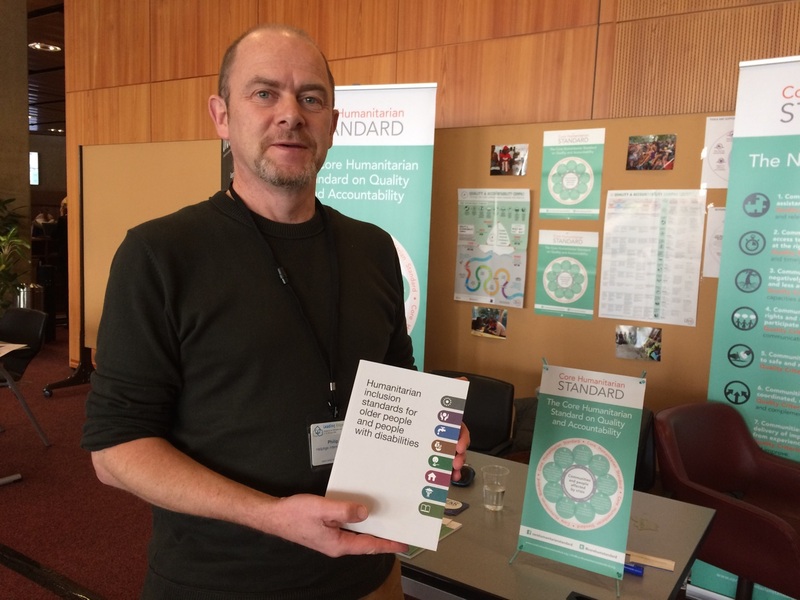 A review of the pilot version of the standards was undertaken in 2017 – a process which included consultations, surveys and interviews with over 300 technical experts, humanitarian practitioners, and organisations of people with disabilities and older people’s associations. In total 139 organisations located in 26 countries provided feedback and recommendations for this revised edition. These standards remain a live document. They are intended to be revised periodically, based on further feedback and recommendations.